My pal Victor in Beijing presented me with this set of signed commemorative postcards from China’s first two manned spaceflights. 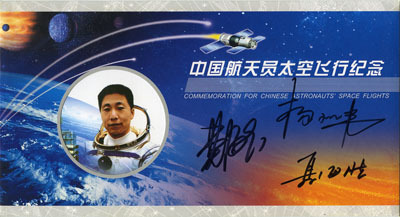 The outer envelope, pictured here, contains the signatures of Yang Liwei, China’s first man in space, and Fei Junlong and Nie Haisheng, the occupants of the second ship up. Inside are three separate cards corresponding to the individual taikonauts, also signed. Victor got the autographs because he works closely with accessibility organizations in China and so he knows the head of the China Disabled Persons’ Federation, Deng Pufang, the son of Deng Xiaoping. With a dad like that Deng Pufang of course has friends in high places and thus were Victor and the spacemen at the same reception. Deng Pufang, by the way, became a paraplegic during the Cultural Revolution as the result of falling from a fourth floor window to escape torture.